From March 4 to 5, UC San Diego will host its third annual “UC Health Hack,” an event dedicated to finding solutions to integrative medicine and global health issues. UC HH is an interdisciplinary effort brought together by the UCSD Health System and Engineering World Health, an undergraduate student organization, to bring students, physicians and industry professionals together to find solutions for pressing healthcare problems. The hackathon will take place over the course of two days, where teams of up to five people will collaborate, brainstorm, prototype and create projects that address critical healthcare issues. All teams are registered under one of two specific tracks, integrative medicine or global health, where they will focus their efforts to address an issue in that field. Registration for the health hackathon is open to all participants over the age of 18 and will be open until spots are filled. The focus for the global health track is refugee health care and the daily challenges and struggles faced by refugees around the world. Local nonprofits such as Survivors of Torture, which works to provide care and resources for survivors of politically motivated torture, will provide guidance on cultural appropriateness and addressing mental health needs. Physicians and professors from UCSD’s School of Medicine who have first-hand experience working in low-resourced health care settings will guide teams in addressing the needs of refugee health care. The partnership with the UCSD Health System has opened the doors for collaboration and mentorship with many more healthcare professionals than in past hackathons, said Yajur Maker, co-director of UC HH and president of EWH. He highlighted the range of resources available to hackathon participants who want to continue work on their project ideas after the hackathon has ended. Other resources include the Entrepreneur Challenge, a collaboration between the Jacobs School of Engineering and Rady School of Management. The organizers will offer workshops on leadership and funding for semifinalists, along with $500 to help get their projects off the ground. Niranjanaa Jeeva, co-director of UC HH and a past participant herself, described the project she created with her teammates Warren College junior Julie Yip and Muir College sophomore Ella Stimson to improve maternal health care. Jeeva explained how her experience in the first UC HH hackathon inspired her to become more involved. “I was really nervous about competing [last year], but I ended up having so much fun I decided I wanted to make sure that others had a good experience, so I decided to take part in the planning process,” Jeeva told the Guardian. Stimson, another co-director of the UC HH, expanded how her past experiences helped push her toward participating in the hackathon. 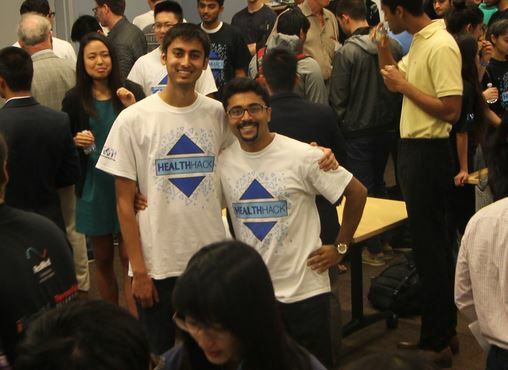 Jeeva and Stimson say that once UC Health Hack 2017 has been successfully organized and executed, their team will continue to develop and prototype the Amniotic Wrap in order to further this project that they are all passionate about.